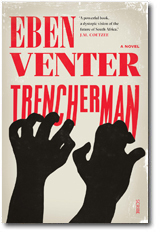 Eben Venter, Trencherman, translated from Afrikaans by Luke Stubbs. London: Scribe, 2016, 336 pp. Trencherman, published as Horrelpoot in 2006, is the seventh novel of Afrikaner writer Eben Venter who, like his protagonist Marlouw, grew up on a South African farm but now lives in Australia. The debt to “Heart of Darkness” is explicit: as Venter writes in his Acknowledgments, “Certain characters, scenes and sentences in the text are reinterpretations and paraphrasings of Conrad’s original text.” Even more than this, the structure of quest and return, the continual deferment of the goal and meaning of the journey, reproduce the pace and episodic movement of Conrad’s tale. Each chapter is headed by a sentence taken chronologically from “Heart of Darkness”; “Camp, cook, sleep, strike camp, march” is how Marlouw imagines the conditions of his life at one point. From rain-soaked Melbourne, Marlouw is sent by his sister Heleen to retrieve her son Koert from the family farm, the “Ouplaas” in the heart of the Orange Free State, in a future South Africa seemingly forever scorched by the explosion of the Koeberg Nuclear Power Station. Jocelyn, with her black knitting, warns him not to go. As Marlouw will say later, “all who have stepped out of the confines of their existence to speak to me or offer advice – I’m now able to place them. They have all crossed my path to point the way to Koert.” Yet Trencherman is not intertextual in the manner of Tayeb Salih’s Season of Migration to the North (1969), or Juan Gabriel Vásquez’s The Secret History of Costaguana (2010), both much cleverer books, answering back to Conrad in various ways; in adopting more simply “Heart of Darkness” almost wholesale, Venter has found a literary structure resonant enough to tell a prophetic dystopia of the end of the Afrikaner, but in so doing has produced a novel whose very immediate, uncomfortable and unconsoling power is not reliant upon the reader picking up Conradian parallels to bring a rich significance fully into view. On the death of their father, Marlouw and, reluctantly, Heleen, had transferred the farm to the three African families who have helped them run it. Putting earth on Pappie’s coffin, Marlouw reflects, “Ours was a history that had passed for good,” and the rest of the novel performs a painful examination of the serious and destructive ironies in that seemingly conclusive phrase. Getting his instruction on the very first page to “go back to South Africa and get Koert out of that damned country,” the club-footed, lonely, yet tolerably successful middle-aged salesman of high-end kitchenware, Marlouw, is called upon to undertake the Conradian journey. Prone to fears and dreams, to experiencing a “deeper domain where occasionally some or other aspect of myself is briefly illuminated,” Marlouw’s journeys by plane and through bewilderingly deserted airports, in taxi and truck, on crowded streets and pot-holed night roads, forms the first third of the novel and, as with “Heart of Darkness,” the most vividly written in its assault upon the senses. In Bloemfontein, Jaap, the broken taxi driver who has stayed on, says, “Oh, it’s been years since we’ve been into the platteland. I’d say it’s become like the dark places of the earth to me.” As Marlouw is almost handed on from person to person, the encounters immerse the reader in a nightmare world at the edge of recognition, the spare, direct writing just about holding at bay a threatening saturation of horrors. Less descriptive than Cormac McCarthy, the rather abrasive short declarative sentences of a first-person narration in the present tense tie the account to Marlouw’s thought-language which makes for vertiginous immediacy more readily than beautifully memorable phrasing. Yet there is a fine tension throughout: the pressure of a moral sensibility upon the amoral camera-eye, and, more disturbingly, the other way round. In this, above all, Venter is a Conradian writer. When finally we meet Koert, he is grotesque in ways apparently quite opposite to Kurtz. Despite all of our modern training in reading dystopia, he offends the reader’s sense of aesthetic decorum. This was not what we came all this way for, we had a right to expect more than this, I hear the protest in my own head. Even the wasted hollowness of Kurtz offers more in the way of aesthetic pleasure. Yet this strange incarnation of the logical end of Afrikaner on this piece of the earth, of the end towards which the Afrikaans language is drawing, this childish monstrosity who perhaps owes something, too, to Alex in A Clockwork Orange, is Venter’s most disturbing creation. More than the darkly unconsoling conclusion to the novel, Koert and his speeches remain uncomfortable for the reader, unassimilable within the pleasing melancholy we can associate with Marlouw at the end. Marlouw, of course, seeks “a final word of revelation” from Koert, but the achievement of the novel is that, by the time he asks for this, he has already understood everything, and also that there is no release for him. “You wonder I didn’t go ashore for a howl and a dance?” challenges Marlow. What Marlouw does I won’t reveal, but it reads as the only uplifting recasting of Conrad that Venter undertakes in his novel. The novel is also peopled with black African characters far more than I have indicated in this review, with some, such as Pilot, Esmie Phumzile and Mildred, playing important individual parts in the book’s development. The charge that no voice and no intelligible language is given to the Africans in “Heart of Darkness” cannot be levelled at Trencherman, and their contempt for the Afrikaner is made manifest, as are other ways of inhabiting the earth than those of European rationality. What this novel leaves to Venter’s Afrikaner readers, I find it hard to imagine. It can perhaps be read as a very bitter elegy for thirteen generations of settlement, or as a necessary act of cultural undoing that promises no brighter future anyway. But it is a meditated, resolved work of art, right to the final page’s passing away of a fantastic invasion (a phrase not used in the novel), that carries its justification for using “Heart of Darkness” in every line.